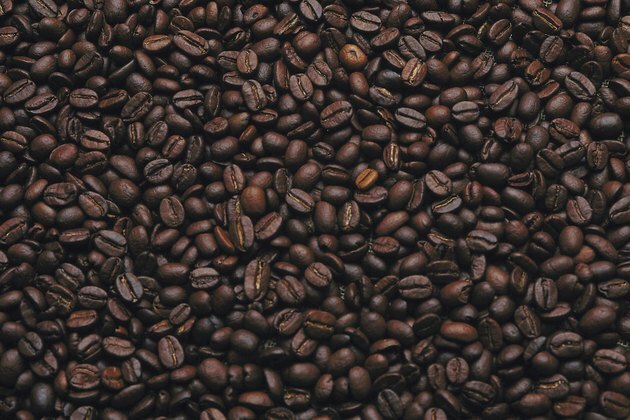 How Much Energy Can You Get From Eating Coffee Beans? Like brewed coffee, whole coffee beans add almost nothing to your caloric intake. As food energy is measured in calories, eating coffee beans will not technically provide you with energy. But coffee beans are high in caffeine, which can make you feel more energetic. One ounce of highly concentrated coffee beans in the form of an espresso provides only 3 calories. As calories are the major measurement of the amount of energy in a food, coffee beans give you very little energy. Adding chocolate in the form of dark chocolate-covered coffee beans, however, gives you a lot of energy, with 216 calories in a 28-bean serving to add to your daily calorie counter. Despite providing very little energy from calories, coffee beans give you a boost because of their high caffeine content. In fact, eating coffee beans provides you with much more caffeine than drinking coffee. In comparison with the 95 milligrams in 1 cup of brewed coffee, a 28-bean serving of dark chocolate-covered coffee beans contains 336 milligrams of caffeine. As 1 ounce of dark chocolate contains only 24 milligrams of caffeine, you can obtain a similar amount of caffeine without the added calories by eating coffee beans on their own. Tufts Journal: Ask The Professor: Why Does Caffeine Give You Energy? Are Jelly Belly Beans a Good Source of Quick Energy for Running?